Biologically Active Form Of Organic Sulfur Found In All Living Organisms! MSM (Methylsulphonylmethane) is a biologically active form of organic sulfur found in all living organisms. It is naturally found in varying amounts in raw unprocessed milk, meat, fish, fruits and vegetables. 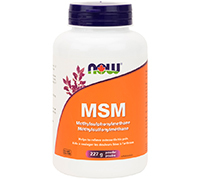 MSM is a multi-use supplement that has been used by fitness enthusiasts. Lignisul MSM is the first brand of MSM specifically developed as an ultrapure food grade for human consumption as a nutritional supplement. Lignisul MSM is a non-animal-based nutritional supplement and is an all-natural source of MSM. In addition, Lignisul has been certified Kosher-Parve by the Kosher Overseers Associates of America. Naturally-occurring sulfur, such as that found in Lignisul MSM, is not similar to inorganic sulfides, sulfites and sulfates to which many people are allergic. Directions: As a dietary supplement, take 1/2 teaspoon 1 to 2 times daily in juice or other liquid.